A group of seated youths and young women, seen performing dances in other associated images. 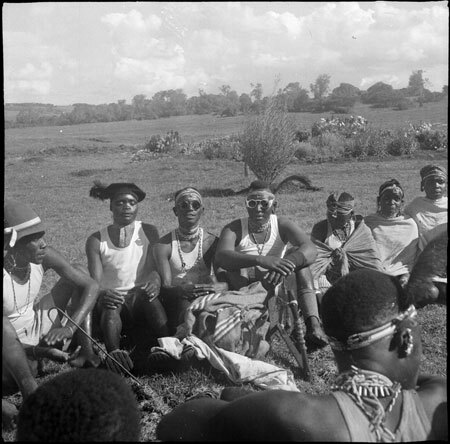 Several of the youths are wearing sunglasses and European headgear, and a stringed instrument with box resonator is partly visible in the centre of frame. This group seem to be associated with a mission or other colonial establishment, the brick building of which can be seen behind them in another image. Morton, Chris. "" Southern Sudan Project (in development). 03 Jan. 2006. Pitt Rivers Museum. <http://southernsudan.prm.ox.ac.uk/details/1998.97.551/>.